Wishing you and your's a very merry Christmas. I have my parents in town for a visit, so I'll be scarce over the next week or so. 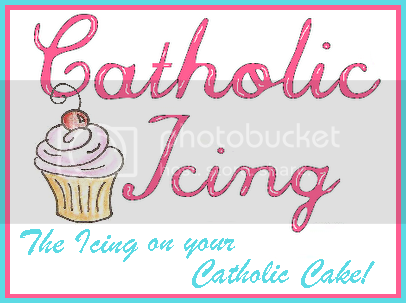 I have been so busy lately that I've gotten in the habit of not updating the blog. I doubt that will change until the holidays are officially over. But, I thought I would share some pictures to show you what we've been up to. First...the play. We had 5 performances in November. 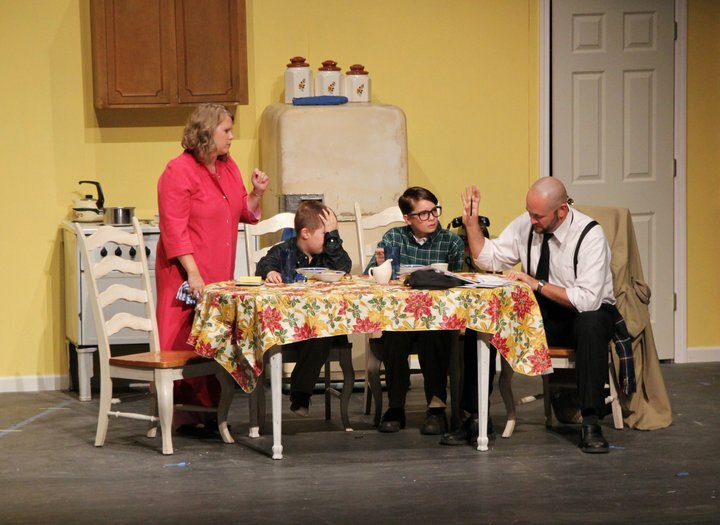 I played the mother in A Christmas Story. This had to be one of the most challenging things I have ever done. Learning that many lines was very tough. I did it though!! Adam, Haley and Ryan sitting near Lover's Leap at Rock City. Haley's choir group singing at Rock City. Standing in front of the snowman rock at Rock City. The boys both got haircuts...finally! Here is a picture of just how long their hair was. I had just cut Adam's hair and was getting ready to do Ryan's. 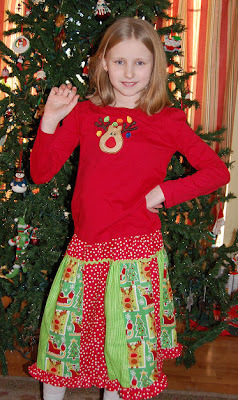 Sewing a Christmas outfit for Haley to wear for her choir performance last week. Haley posing with her BFF Jaiden at their choir concert. Haley performing with the entire Hilger Higher Learning choirs. CHEA (our homeschool group) Christmas party at Ruby Falls! Karaoke fun at the Christmas party. So, that brings us up to date...as of last Friday anyway. Over the weekend we finally got our Christmas shopping done. Glen was off on Friday and did some shopping while we were at the Christmas party. Saturday he kept the kids busy while I finished up. My parents are coming to stay this Thursday and my guest room is buried under clothes the kids have outgrown that I keep meaning to list on Ebay, and tons of ribbon and fabric from my various bow making/sewing endeavors. Busy week for me!!! If for some reason I don't find the time to post again, I hope all of you have a very merry Christmas!! Okay, I know I've descended into the realm of those that never post. But, I've been really busy. We finally got finished with the play. It all went well and I'll share photos as soon as we get them. As soon as that was finished along came the added stress of the holidays. So, with that in mind, here's my top ten list. Clean my house from top to bottom!! With us being so busy lately, my house has suffered badly. It is seriously gross. Decorate the bare Christmas tree standing in my living room. My hubby's idea of helping with the decorations is to get down the tree, put it together, stand it up in front of the window and say "there, I helped". Voila...instant Christmas. Get the decorations down from the attic and decorate the house for Christmas. Buy presents for Christmas. As of today's date, I have exactly 4 presents purchased!!! Bake a mountain of yummy treats to give to family and friends. Oh, and for us to eat and gain like 50 pounds. Win the lottery...rob a bank...knock off an armored truck...something like that to fund Christmas present buying. See number 4 above. With the extra money from lottery winnings/felony activity, hire maid to clean house. See number 1 above. Since I'll probably have lots of money even after buying presents and hiring that maid, I can simply hire Martha Stewart to come to my house and do the decorating. See numbers 2 & 3 above. With leftover money from lottery winnings/theft, hire Paula Dean to do all that holiday baking for me. See number 5 above. Spend remaining money on a several week stay at a fat farm from all the cookies/fudge/pies/cakes, etc. that Paula Dean made. Oh, and I guess I'll have to hire a nanny to watch the kids while I'm gone. And there it is...my grand list of things I must do. How are your holidays shaping up? I don't know why I do this every year. You'd think Christmas was some kind of a surprise or something? As my mother likes to remind me, "it comes the same day every year". Why on earth do I always wait until the absolute last minute to do things? Yes, I'm a chronic procrastinator!!! I admit it! I need therapy or something to resolve this problem. So, with that said I'm off to attempt to further educate my children, and then clean the above mentioned gross and disgusting house. Maybe, just maybe I'll even find time to do some decorating while I'm at it. 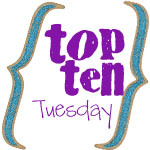 For more great Top 10 posts, head on over to Oh Amanda's blog. 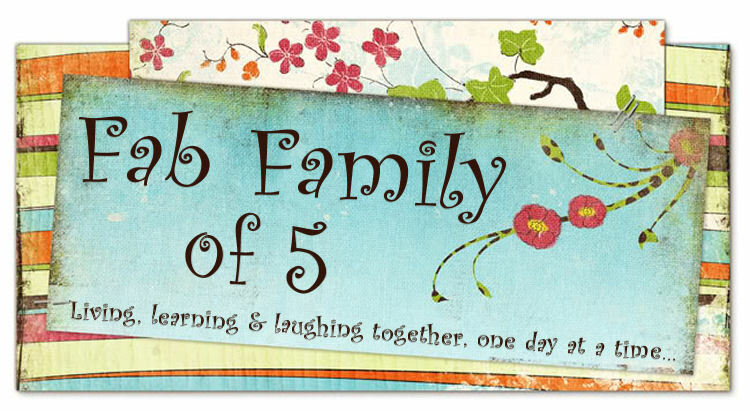 She has a great post featuring some awesome do it yourself projects. Just what I need...more fun ideas to distract me from what I need to be doing.